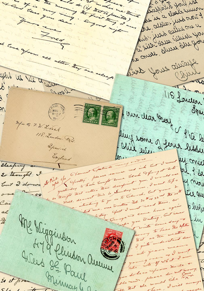 One summer day, Kirsten Josephson, her mother and her grandmother came across a box of hundred-year-old family love letters. Years later, Kirsten would photocopy these love letters written on thin onionskin paper and begin her work as illustrator for Dear Heart: The Courting Letters. 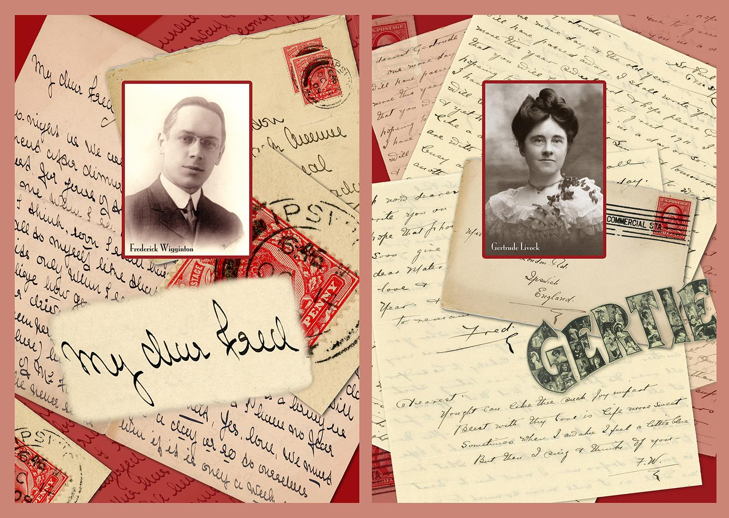 This book is a transatlantic love story about her great grandparents, Gertie and Fred. It was written and researched by her parents, renowned children's author Judith Josephson and Ron Josephson. I asked Judith why we love handwritten love letters. JJ: A personal handwritten letter shows something about the personality of the writer. Fred’s handwriting was meticulous and beautiful and he wrote 16-page letters in brown ink. It showed his attention to detail and the way he shouldered responsibility. Gertie’s handwriting was rounded and open-ended, much like her approach to life. Sometimes her writing trailed up the edges of the pages or onto programs she inserted. Gertie was an amateur artist, so many of her letters had little sketches or drawings on them. Fred often signed his letters with designs of x’s after his name. As he had been born and raised in childhood in France, he sprinkled French phrases throughout his letters. I have an envelope of Gertie’s antique paper reliefs with beautiful cutouts of flowers. Long ago, people might have slipped them in their letters. Both Gertie and Fred poured their feelings and emotions into the letters, telling each other what they were thinking, dreaming about, and wondering. In a handwritten letter, there is no pressing an emoji to convey feeling. Instead, words and illustrations do that job. I also asked Kirsten about her work as illustrator. LS: Considering your background in art, graphics and print media, what was your biggest surprise when using love letters as primary source materials for illustrations? 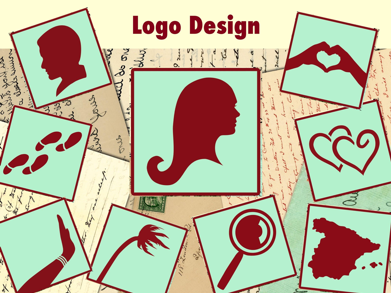 I found myself connecting back to skills I had developed via my amazing Graphic Communication professors at Cal Poly, San Luis Obispo, accessing the beauty in typography, paper weight, printing, embossing, and photography to create designs in Adobe Photoshop and Illustrator. LS: When sorting through photos, letters, postcards, and memorabilia from Gertie's and Fred's lives, how did your theme come together? What guiding concept emerged to govern your design board? KJ: My design board was driven by the chapter content. I looked for artifacts that could be used to symbolize travel and transportation, modes of communication, geography, family, history, love, time, and real-life people and places. The detailed postal stamps on the letters from the U.S. and the U.K. in the early 1900s provided beautiful accents to the chapter openers. 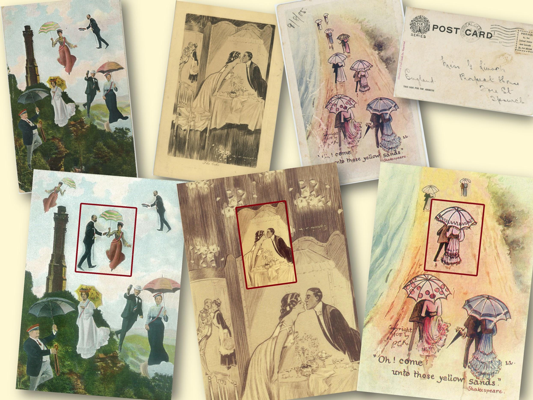 The ornate postcards from over a century past meshed well with the themes and provided a wealth of imagery and color. LS: How did you choose your color scheme? KJ: To stay true to Gertie and Fred, I wanted the color scheme to reflect the colors of their original onionskin letters. The letters are in a variety of colors, such as light pink, cream, tan, and mint green. I used those colors as a foundation color scheme for the book and infused cranberry and hunter green as a dark accent. 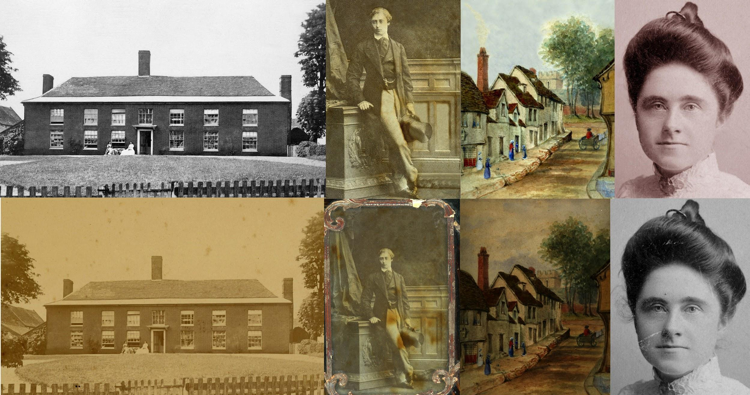 LS: Are there any process issues you'd caution other illustrators to consider when using primary source materials? We had to make sure that we checked copyright; this is always an important practice when working with primary sources. Generating hundreds of digital files for a large project like this, it was easy to become disorganized. I eventually developed an organizational structure that contained logically named folders, subfolders, and files (based on chapters, people, geographic locations, etc.). This structure has served me well over the past few years when I’ve needed to quickly access images for marketing purposes. Many thanks to Kirsten Josephson and Judith and Ron Josephson and of course to Gertie and Fred for helping us out with this Valentine’s edition post of Illustration News. 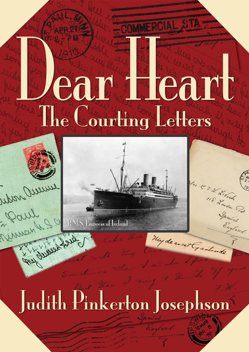 Dear Heart The Courting Letters is available in the SDSU Library's collection on the fourth floor at call number PS3610.O66784 D43 2016 and on Amazon at https://www.amazon.com/Dear-Heart-Judith-Pinkerton-Josephson-ebook/dp/B01M0FYT3O. Also, we extend our thanks to the Josephson Family Endowment for supporting the children's literature collection for many years. Happy Valentine's Day and thanks for reading.